Indian Women Role Models Are The Stars Of 'The Dot That Went For A Walk' : Goats and Soda And they ended up writing a children's book highlighting 51 women, past and present. It's called The Dot That Went For A Walk. 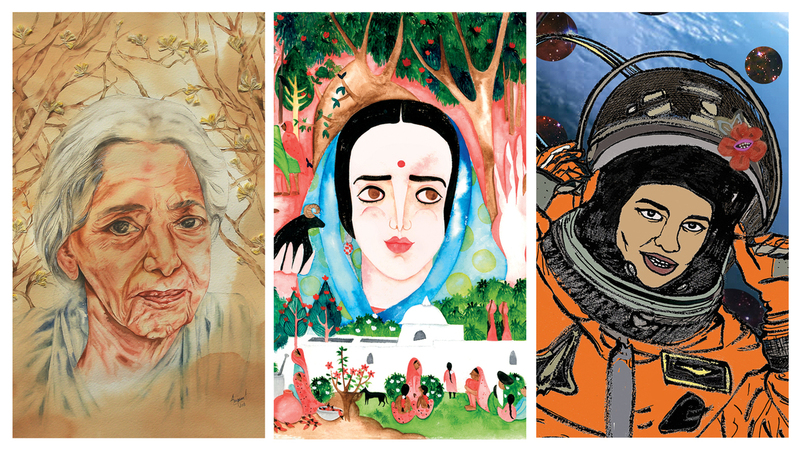 From left: Janaki Ammal (1897-1984), a botanist who developed a sweeter type of sugar cane; Amrita Sher-Gil (1913-1941), a Hungarian-Indian artist who loved painting traditional Indian customs; and Kalpana Chawla, the first woman of Indian origin to go into space. Three Indian women who were close friends often discussed how inspired they were by their own mothers. They wondered if their daughters had female role models, too. So they decided to ask them. They posed the question to their girls, two 18-year-olds and two under age 12. The girls came up with the names of Western pop singers. When pressed for Indian names, they mentioned Bollywood and sports stars — but couldn't think of a single Indian woman from other disciplines. "We extended this conversation to our daughters' friends and then to their classmates," says Sarada Akkineni, a director at Blaze Automation, a home automation company in Hyderabad, India. "We wanted to include the boys in the discussion, too — and we were so surprised when they could not name even a single female role model. But that's when we realized it's not their fault. We don't tell the stories of our women and celebrate their achievements enough." So Akkineni began writing a list of all the inspirational Indian women, collaborating with her friends Reema Gupta, a co-director of the Women's Excellence Initiative at the Indian School of Business, which aims at bridging the gender gap in the corporate world, and Lakshmi Nambiar, a former investment banker who now runs an art gallery in Hyderabad. They decided to turn the list into a book, The Dot that Went for a Walk. It was self-published by Caterpillar Wings, a tech and publishing company co-founded by the three women. The book was released in January with a first print run of 4,000 copies, distributed by Amazon. The book gives short biographies of 51 Indian women of note, each illustrated by a female artist. The artists worked with various techniques and materials: computer art, watercolors, oil paints, embroidery, cloth, canvas, paper, wood and 24-karat gold foil. "We wanted to expose children to a variety of art as well," says Nambiar. Why 51? Odd numbers are lucky in Indian tradition. But the authors could have gone even higher: "When we first started out, we weren't sure how many stories we would find. But soon, there were far too many inspiring stories to choose from. There were women from all disciplines and all walks of life; narrowing it down was hard," says Akkineni. And where did the title come from? It's a quote from the artist Paul Klee, says Akkineni. He said that "a line is a dot that went for a walk." "A dot in motion can draw a line, a squiggle, a curve, endless patterns, can create a masterpiece," says Akkineni. "For us, the title reflects the diverse journeys and the different paths of the women in our book." Gupta knows from personal experience how a role model can change someone's life. Her own mother, Basanti Gupta, now 77, has told her how, as a 10-year-old back in 1950, she met a female doctor in a white coat for the first time. The doctor had come to deliver her sister's first child at her home. "I want to be like the lady in the white coat," Basanti said at the time. The doctor's quiet confidence, efficiency and self-assured air had impressed Basanti, and she wanted to be in a position to help others. And that's what she did, devoting energy to her studies and eventually becoming a pathologist. "Thanks to my mother and her female role model, we now have a generation of doctors in the family," says Gupta. The book includes a number of historical figures. The Hungarian-Indian artist Amrita Sher-Gil (1913-1941), loved painting village customs. Her famous painting, Bride's Toilet, (1937), provides an inside look at a bride being pampered during traditional Indian wedding preparations. She was criticized for her sorrowful paintings yet refused to change her artistic style to please her critics. Like Sher-Gil, there are many examples of women who have never felt the need to conform and who waged quiet battles. Janaki Ammal (1897-1984), a botanist, went to London after her male co-workers in India refused to work with her because she wasn't married. Ammal eventually returned, bred a new variety of sugar cane, sweeter than the Indonesian one imported to India at the time, and was honored when a blossom, the Magnolia Kobus Janaki Ammal, was named after her. Some of the women in the book are famous — like Indira Gandhi, India's first female prime minister. But others rarely get a mention in history books, says Aloka Parasher Sen, historian and former dean of the School of Social Sciences at the Central University of Hyderabad. One example is the country's first female lawyer, Cornelia Sorabji (1866-1954), who returned to India in 1894 after studying at Oxford. She gave legal advice to hundreds of Indian women who were forced to wear a veil, who could not leave their houses and were not allowed to communicate with men, counseling them on how to manage and defend their property. The book also includes contemporary women who have made an impact on science — like a little girl from Lucknow named Ritu Karidhal who became a rocket scientist. She was a deputy operations director who helped launch Mangalyaan, India's rocket to Mars. As a child, Karidhal asked many questions. Do aliens exist? Is there life on Mars? Why do stars twinkle and why does the moon change shape? "Asking questions like Ritu did was important, because the more you know of the world, the more you can become a part of it," Akkineni writes. These stories make Indian women, their struggles and successes more more visible, especially to children, says Sen.
"It's only in recent years that textbooks are beginning to address the role that women have always had in shaping India's history," she says. "Inclusive narratives like these help," she says.